Choose from 7 hotels and guest houses in Anglesey. Shown below a just a selection of the hotels available. To search within an area please use the menu on the right. The 4 star Bull Hotel is situated in the centre of Llangefni. With easy access to the A55, connecting road for Holyhead. 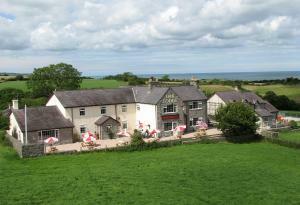 Stay in one of the top 4 star Welsh Tourist Board hotels on the island of Anglesey. Bangor only 15 minutes away. Set in a region of outstanding natural beauty, Llangefni is also an ideal base to explore the beautiful and varied North Wales area. The panorama of Snowdonia Mountains are attractions not to be missed. A major renovation was completed in 2004. rac and aa listed. A number of rooms are available on ground floor in the courtyard. In Treaddur Bay, on the stunning coast of the Isle of Anglesey, the Seacroft is a 5-star restaurant with rooms, offering free Wi-Fi, superb locally sourced food and a cosy traditional bar. The Seacroft has received a 5-star rating from Visit Wales in its Restaurant with Rooms category. There are 6 individually decorated rooms, each with their own unique charm and each named after one of the beautiful beaches on Anglesey. Each room has a flat-screen TV, Egyptian cotton bed linen and a modern bath or shower room. Some of the rooms have private balconies. With a roaring log fire and superb local food, the Seacroft is a great place to sit back and relax in stylish and comfortable surroundings. There is both a bar menu and a restaurant menu, with the finest, freshest, locally sourced seasonal produce used throughout. Lobster comes from Trearddur Bay itself, from a boat based just a few hundred yards away.